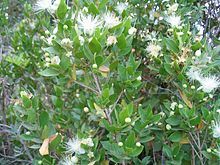 Myrtaceae is the myrtle family, a faimily o dicotyledonous plants placed within the order Myrtales. ↑ Wilson, P. G. (2011) Myrtaceae. In The Families and Genera of Vascular Plants. Volume X. Sapindales, Cucurbitales, Myrtaceae, edited by K. Kubitzki, X:212–71. Heidelberg: Springer-Verlag, 2011. This page wis last eeditit on 12 Apryle 2017, at 17:16.